A portable hard drive, also called an external hard drive is one of the best solutions for keeping your data safe outside of your computer, keeping a backup of it, and transferring it from one place to another. 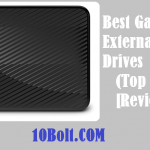 You could treat yourself with a lot of options but we have got the best for you in this list of Top 10 Best Portable Hard Drives 2019. 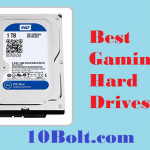 How do we choose our Best Portable Hard Drives 2019? The Data is getting bigger and bigger these days and with all the big games, movie sizes, and other documents capturing GBs of space on your hard drive, it might fall short for that. Also, when you need to move this data, it wouldn’t be possible unless you have a fast device with large storage. This is when these portable hard drives are useful and today, we are ranking the best ones. The storage and speed are the two top factors we look forward to while ranking these portable hard drives. The speed is major considerations because when we are talking about data transfer in GBs, the slow speed hard drives would take hours to move that data. When a hard drive promises some good speed range, then we can choose the size we need and move on. The speed of the hard drive depends on the RPM it moves with and thus we also consider them. In the end, we do consider the prices as well because the portable hard drives with storage sizes in terabytes are quite expensive. We shall now move and do the reviews of these portable hard drives. 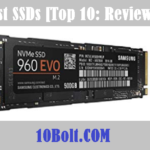 Although we have a few related guides like best gaming hard drives of 2019, best SSDs for gaming 2019 and best flash drives 2019 as well. 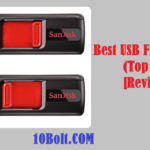 But here we have collected 10 Best Portable Hard Drives 2019 and have written its reviews, features and pros and cons after detailed research and testing so that you can easily select the one with your requirements and budget. There is NFC security enabled. Its only con is its speed which is not very fast. Has a nice rugged design for the users. There aren’t a couple but many reasons due to which we have ranked Buffalo Mini Station at the top even when there is a brand like Western Digital and Seagate out there. The first thing which we appreciate about this product is that getting a portable hard drive of 2 TB isn’t easy these days and you are getting that with NFC security for data protection. Yes, that is true that you are getting all the premium features of this portable drive just under the price of a hundred dollars. However, there are always some cons of these things which seem big in a small price and as far as this Buffalo Mini Station portable hard drive is concerned, the weakness it possesses is the slower speed for data transfers. Yes, when you are copying and moving large data files, you will have to be patient about that. Anyway, it is safe, durable, secure, and cheaper which works for most of the users. This portable hard drive is cheap. It is also very durable and secure. One of the most affordable hard drives. The USB cable is built-in. Known for its large data capacity i.e. 4 TB. Besides the large storage, its speed is also good. Has its own backup software. Connects using a USB 3.0 interface. You don’t wish for Western Digital products unless you have got a big budget in your pocket. The same is quite the opposite when Western Digital My Passport 4 TB is on the market. Now, this is a WD portable hard drive with much larger storage capacity but it also happens to be a bit slower. This is something we don’t expect usually from a brand like Western Digital but if you have made your choice of getting a 4 terabyte hard drive then go for it. This release from 2016 has seen a major decline in price and demand, however, it is still one of the relevant portable hard drives if you are willing to get it. Western Digital My Passport 4 TB takes of your data with better encryption features and also has a stylish look. The software suite is pretty comprehensive and you shall not face a lot of trouble except the waiting time while copying the big files. A very attractive design to own. Cost per gigabyte is pretty cheap. The software suite is also impressive. Very low while moving larger files. ADATA SD700 External SSD is one of the fastest ones in the business. 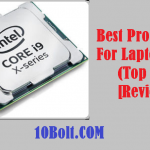 Known for its great performance and has IP68 rating as well. Connects using a USB 3.0. Storage options of 256 GB, 512 GB, and 1 TB are available. There hardly are times when your data transfer and storage needs exceed a terabyte. In fact, most people need half a terabyte for life so what they actually look forward to a faster hard drive instead of the one with large storage. While such are the needs, you better stick of an SSD instead of a hard drive and when it comes to the portability which is main feature demand, there is hardly any product better than ADATA SD700 External SSD out there. Now, it is true that compensating the price is not in our hands when it comes to this type of hard drive. You will have to pay a larger sum to get an SSD of 500 GB. However, what you will be getting is superfast drive with IP68 waterproof design rating and a great performance which is always the ultimate goal. In fact, the ratio between price and performance is pretty ideal and most of you can afford to have this. You will love the great performance. The ratio of price and performance is ideal. IP68 waterproof design rated SSD drive. A portable and durable device to have. This would cost you more. This is the external hard drive with the largest storage capacity. The hard drive also has the RAID support installed. A couple of cons includes the expensive price and two USB ports needed for connection. Its speed is average but this is the best you can get with such large storage. Being mentioned in the title doesn’t mean that you must go for the 16 TB version of WD My Book Duo portable drive. You can also go for the 4 and 8 TB editions as well. What really matters is the quality and speed of this portable hard drive even though this asks for a price which mostly seems can’t seem to afford. But some great performance and speed come at a price. In fact, you should buy the 4 TB version without compromising on the quality. The other things we like about this WD My Book Duo is its ease of use, portability, stylish design, and compatibility with the DropBox where you can back up all the data you want. The USB3 hub which is added in this drive is also a pretty impressive feature which we would like to mention. Though the warranty isn’t long, you can rely on its build quality. An easy-to-use drive to have. USB3 hub is added which is also great. Comes alongside a good software bundle. A costly drive to buy. This one gives you the storage options of 1, 2, 4, and 8 TB. Besides the large storage options, it is also very fast. It has its own software as well but only for Mac computer. When you are on a desktop and mainly for gaming and television series, things can get bigger and I mean really big. You have to store terabytes of setups and videos files and for that, one of the finest solutions you can get are OWC ThunderBay 4 Mini Storage Drives which are available in 4, 8, and 12 TB storage sizes. Well, these aren’t like other ordinary drives because they have been made pretty advanced for better customization of the data. As far as the RAID settings of these hard drives are concerned, those are linked with the disk utility. OWC ThunderBay 4 Mini is multi-bay storage and there are a lot of benefits of these drives including the complete control of speed and storage. However, you are going to need some learning which you will have to put in that work. We also recommend this one because of the simple and attractive design. The most versatile desktop storage. You can get different storage options. The speed and redundancy can be controlled. Storage options from 4 to 12 GB are available. The speed settings are complex though. Most of them are expensive. One of the perfect blends of the portability and the large capacity. The USB is not a compulsion for making a connection with this one. It is expensive but also one of the most durable options. 8 TB storage and a USB 3.0 port are also present. Seagate is one of the dominating brands when it comes to manufacturing hard drives but portability hasn’t been their major focus for years. Now, they have put forward some efforts in this department and among many products which they produced, we think Seagate Innov8 8 TB definitely deserves a spot on the light. This durable and portable storage drive is one of the finest drives you can get and when plugged inside a USB 3.0 port, you will see this one transferring data very faster. What you get from Seagate Innov8 8 TB are durability, stylish look, portability, and large storage options. There are many experts we know who prefer this device over others but since these are also expensive, you shall consider buying it after having a glance at your account. The device is also known for its ease of use and since it is faster, it is good for moving big files like game setups. A sleek and stylish design. A portable and fast hard drive. The use and customization are simple. What’s even heavier is its price. This Seagate portable drive gives you a 5 TB storage option. Besides the storage capacity, this one also delivers high transfer rates. 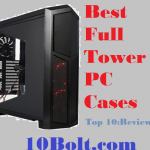 Better for the Mac PCs than others. Known for its durability and reliability. Mac Computers own a different setup and thus there must be enough hardware for them as well. Thus, to provide portable hard drive options for Mac, we are now bringing Seagate Backup Plus Desktop Drive 5 TB which should better be connected with for some quality performance. However, it works fine with Windows PCs as well. The storage option of 5 terabytes is more than enough to store all the big data you have. However, it might fall shorter for the organizations and thus they might go for one of the above options. The drive is durable and for higher speeds, this would certainly be a wiser choice. A high capacity storage drive. It has a dashboard software. A price which is quite affordable. A reasonably fast storage drive. A very durable drive as well. The power adapter is wall-wart. Not equally Windows performance as Mac. This has been rated as the ‘Wireless Wonder’ by one of the best tech hubs. You can connect this portable hard drive either with a wireless connection or USB 3.0. Its battery life is great on which you can work for longer. Gives a nice storage option of 2 TB that is sometimes more than enough. 200 dollars for a 2 TB portable drive might seem too much. Well, your worries could be justified but this Western Digital My Passport Wireless Pro doesn’t allow so due to features like small and convenient design, versatile, ease of use, SD card slot, Wi-Fi options, and very low power requirement. Also, the management software which comes alongside this device is very simple. Some of the shortcomings of Western Digital My Passport Wireless Pro include the battery life and limited file format support. Also, the settings are said to be confusing the newer users. Overall, it is a pretty satisfying and complete package if you have got the budget for it. An easy to use the portable drive. SD card slot for expanding and copying data. Should’ve been a complete metal body. A large capacity option of 4 TB good for gaming and office work. Its design is really attractive and the speed is very fast. It was likely to be expensive with all of these features. Without USB C-Ports, you can enjoy the best of its speed. LaCie Porsche Design Mobile Drive 4TB solves one of the biggest problems related to portable drives and that is compatibility. The compatibility of which we speak concerns the FAT/FAT32/exFAT file system, which is supported by all major operating systems, including those embedded in car stereos, DVD players, industrial controllers, and other devices. This one provides the best physical and data security. iStorage diskAshur 2TB has a nice and rugged design which you will like. It is expensive but also very durable. A nice storage space of up to 2 TB. From the outside, the diskAshur Pro2 looks much like any other portable hard drive. It has a captive USB cable, which clips neatly into the side of the drive. While this is good for neatness, the captive cable means you can’t replace it should it or the USB connector get damaged. There’s a neat carrying case in the box, too. The main external difference between the diskAshur Pro2 and a traditional USB hard disk is the numeric keypad on the front. When you plug the disk into a USB port, you have to first enter the PIN and hit the unlock button before the drive can be recognized and used by Windows. This level of protection stops the drive from being stolen, connected to a computer and your data being removed. So, this was our list of 10 Best Portable Hard Drives 2019. If you any queries use the comments section below. For more products like these check the relevant guides below.